I've got a confession to make. 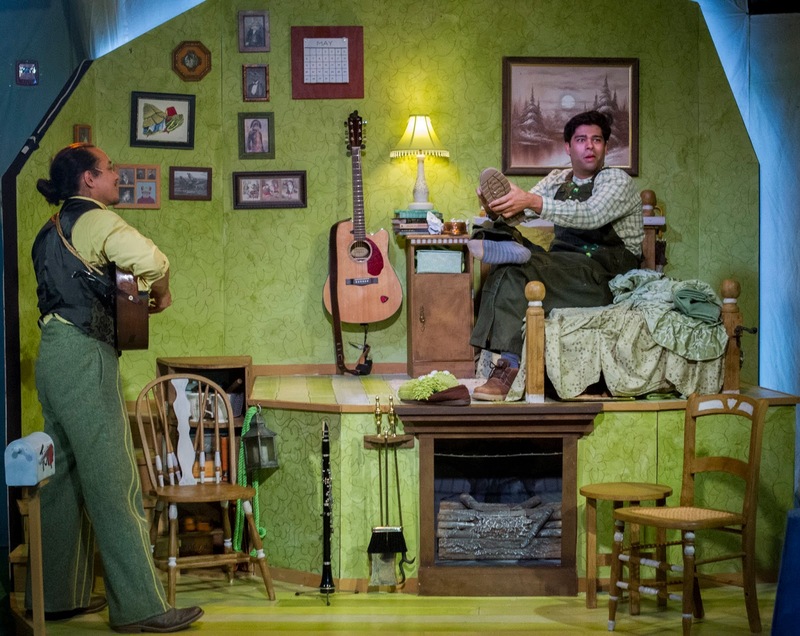 I just saw A Year With Frog & Toad with no children in tow. Before the show started, I sat between two preschoolers, kind of awkwardly hoping the moms bookending them would each assume I was there with the other kid, and not some weird, middle aged lurker. It was actually relaxing not to be wiping noses, wrangling squirmers, and asking a whole family repeatedly if they needed to go potty, but I remember those days well. As I listened to the endless kid questions and happy chatter, it took me back, and I started chatting with the moms, asking the kids if they were excited for the show, and bouncing a bit in my seat in anticipation, too. Once the kids settled in for the duration and started lap sitting and snuggling up with their parents it was lovely, but a bit bittersweet too. 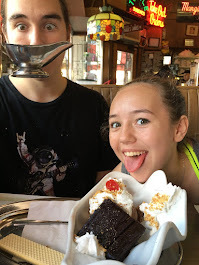 My kids are now 14 and 16, and they still would have come with me, as they did for The Station's opener, Manual Cinema's Magic City, and CCT's The Year I Didn't Go To School, in March, but they're both cast in a show at Actors Gymnasium and had rehearsal. 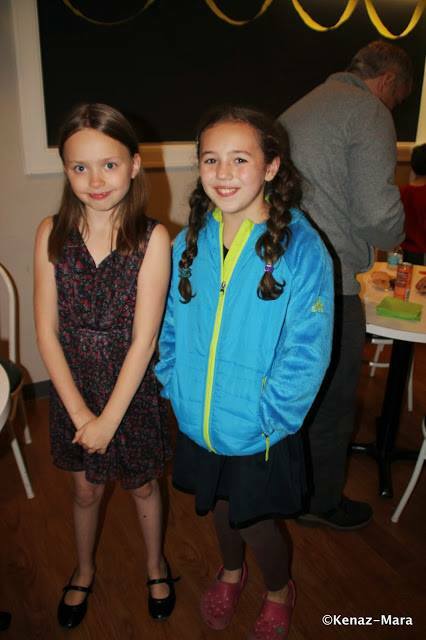 Maybe all those great CCT shows they saw as tots lead to a lifelong love of theatre. My husband jokes that I doomed him to a fate as parent/audience member in an endless string of shows. 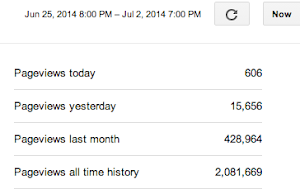 I consider my cultural conditioning a success and couldn't be prouder. 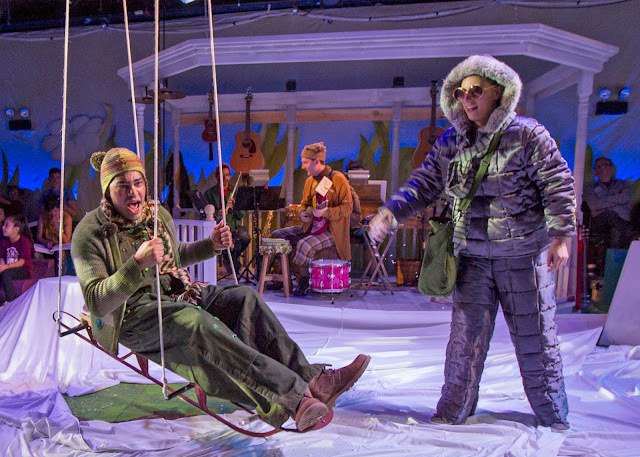 We were there as a family for the 2006 version of A Year With Frog & Toad, Chicago Children's Theatre's first production ever, in Goodman's smaller theatre. We sat in the balcony and I may have been more jazzed for the show than my then 3 and 5 year olds, but by the end, even my theatre reluctant husband was won over. We all adored the show. 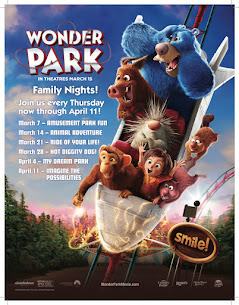 For months after, I'd hear snippets of show songs, dialogue and scenes creep into the kids' creative play and I'd grin. 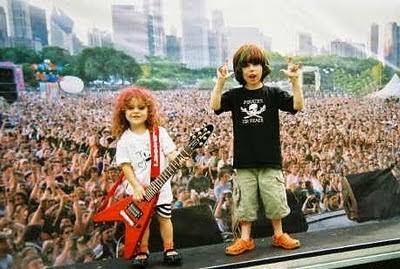 Sage & Dugan at Kidzapalooza that same year. 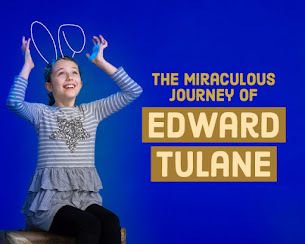 In 2013, CCT did a well received remount at Ruth Page Center For The Arts, and I was thrilled that my then tweens (age 10 & 12) were still open to a kids' show, and truly enjoyed it. It's a mark of excellent children's theatre when the adults and older kids are just as well entertained as the littles. This show is timeless fun for "kids" of all ages. 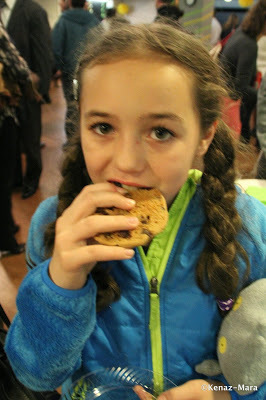 **WARNING: Watching A Year With Frog & Toad may lead to an uncontrollable desire for eating cookies! Flash forward to 2017. The cast has changed, CCT has a home of their own, and A Year With Frog & Toad is still one of my all time favorite children's theatre shows! I've loved watching it's evolution through three different incarnations at Chicago Children's Theatre and can't recommend it highly enough. 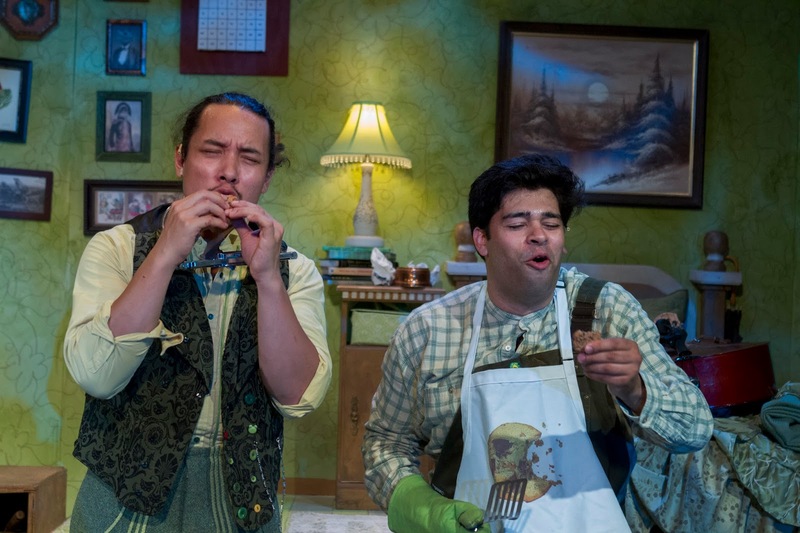 Andy Nagraj as Toad and Matthew C. Yee as Frog are crazy impressive, playing multiple instruments and bringing this charming tale to life with finesse. 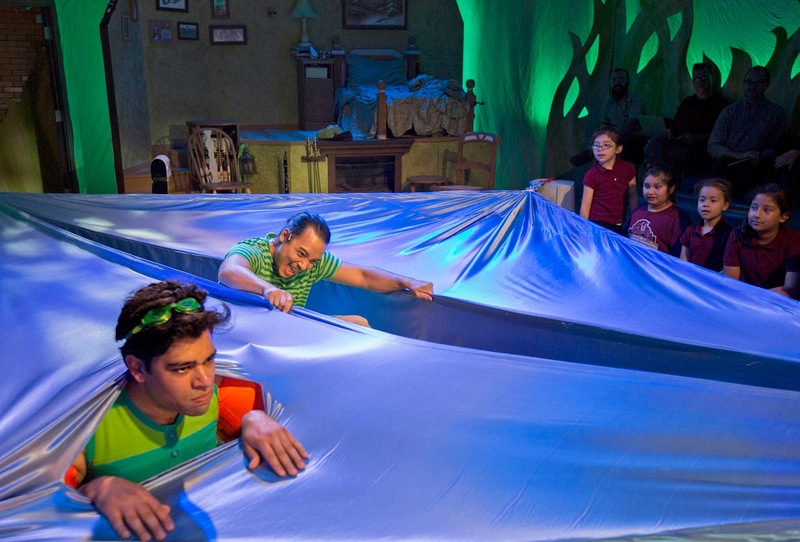 This time around I was enamored with the swamp set that encircles the audience, with a lovely little, well traveled path between Frog and Toad's homes on either end of the space. The animal band holds center court in a playful gazebo. It's exciting to see how flexible The Station space is, with movable seating. There were plenty of real chairs for those more comfortable with a seat back and some leg room and loads of low, kid sized squishy benches, perfect for family cuddling. There's even a section close to the door, for those who may not make the full hour without a potty break. Cherish those years when the kids are young. In this moment, you may be sick to death of diapers, being on call 24/7, and having little people on top of you, needing things relentlessly, but truly, the days are long and the years are short. 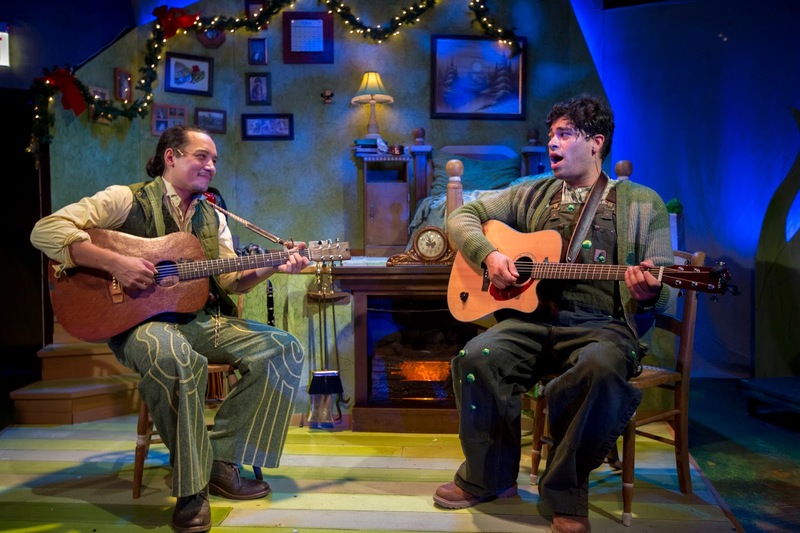 Who knows what the changing seasons will bring, but I know not to miss a chance to catch A Year With Frog & Toad. Make some memories. 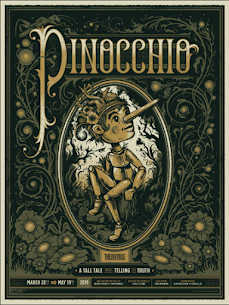 This production just might be the start or continuation of a lifelong love affair with theatre for your littles. Maybe in that hazy, hard to fathom future, when your tots are teens, you'll be seeing Frog and Toad for the third time, and you'll leave knowing that you too can handle the seasons of your life, as long as you've got old friends to hang with, and stellar shows on stage. 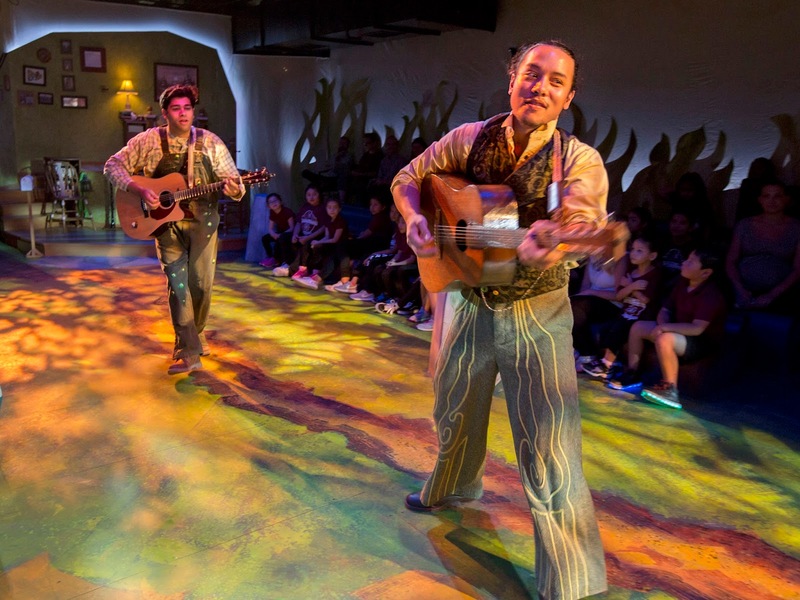 Matthew C. Yee (on guitar) plays Frog and Andy Nagraj plays Toad in Chicago Children's Theatre's A Year with Frog and Toad. A musical for the whole family! 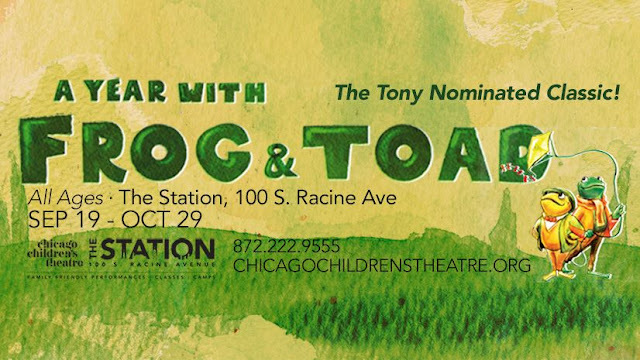 Acclaimed Chicago director Stuart Carden and music director Andra Velis Simon are creating a highly entertaining, all-new production of the Tony-nominated musical based on Arnold Lobel’s beloved Frog and Toad book series. Join two best friends – cheerful Frog and grumpy Toad – on a trip through spring, winter, summer and fall filled with adventure, for a joyful, all-ages musical about a friendship that endures all seasons, despite their differences. A multi-talented cast of Chicago actor-musicians - led by Andy Nagraj as Toad and Matthew C. Yee as Frog - will not only recreate Lobel’s delight stories on stage, but also play a variety of musical instruments on every song. 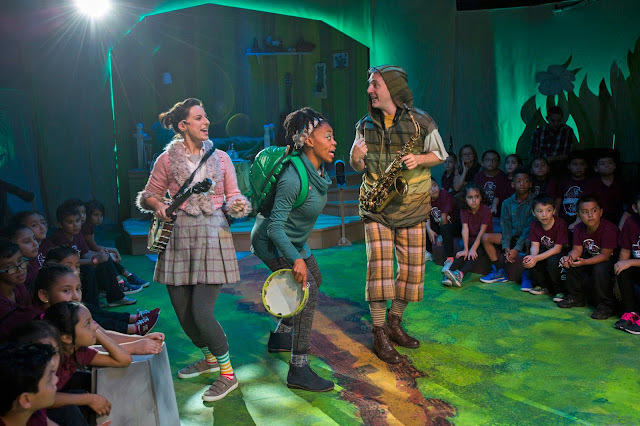 CCT’s twelfth season opens with a brand new take on A Year with Frog and Toad, the all-ages show that successfully launched the company in 2006 at Chicago’s Goodman Theatre. Acclaimed Chicago director Stuart Carden will direct and choreograph CCT’s all-new, reimagined production of the Tony-nominated musical based on children’s author and illustrator Arnold Lobel’s beloved Frog and Toad books. A multi-talented cast of actor-musicians will not only share Lobel’s beloved stories but also play a variety of instruments on every song. Andra Velis Simon is music director. Lobel's beloved amphibians hop from the page to the stage in this heartwarming musical that follows two best friends – the cheerful, popular Frog and the rather grumpy Toad – through four fun-filled seasons. Waking from hibernation in the spring, Frog and Toad go swimming, rake leaves, go sledding and learn life lessons, celebrating their differences that make them unique and special. 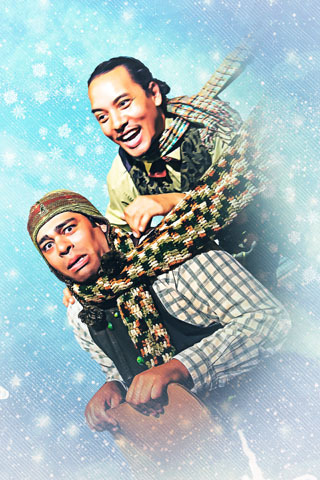 Full of joy and energy, top musical numbers include “Cookies,” “Getta Loada Toad,” “I’m Coming Out of My Shell” and “Merry Almost Christmas.” Part vaudeville, part make believe, all charm, A Year With Frog and Toad tells the story of a friendship that endures, weathering all seasons. 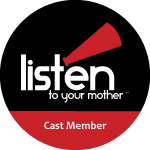 Performances are September 19-October 29, 2017 in the new, 149-seat Pritzker Family Studio Theatre at Chicago Children’s Theatre, The Station, 100 S. Racine Ave., Chicago. Performance times are Tuesday through Friday at 10 a.m., Saturday at 10:30 a.m., 12:30 p.m. and 3 p.m., and Sunday at 10:30 a.m. and 12:30 p.m. Savvy, culturally inclined families know they can save lots of money with a variety of Chicago Children’s Theatre 2017-18 multi-show Subscription Packages, now on sale at chicagochildrenstheatre.org or by calling (872) 222-9555. 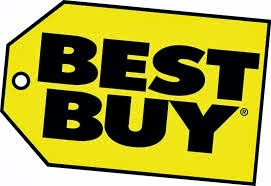 Choose between pre-built packages or a Choose Your Own package for maximum flexibility. Younger Audience Fixed Packages, recommended for ages 2 to 6, include A Year with Frog and Toad, plus The Beatrix Potter Holiday Tea Party and My Wonderful Birthday Suit! 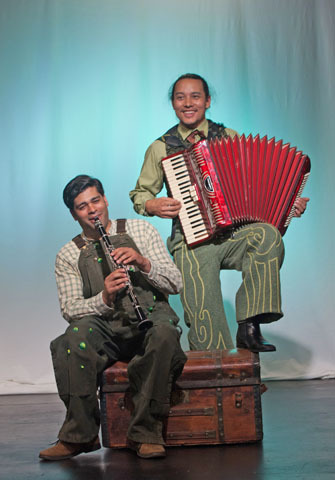 Older Audience Fixed Packages, recommended for ages 6 and up, include A Year with Frog and Toad, along with An Epic Tale of Scale and Last Stop on Market Street. Fixed Packages are $100. Benefits of subscription packages include flexible ticketing exchange, a 10% discount and no processing fees on additional tickets, and discounts on CCT classes and camps. 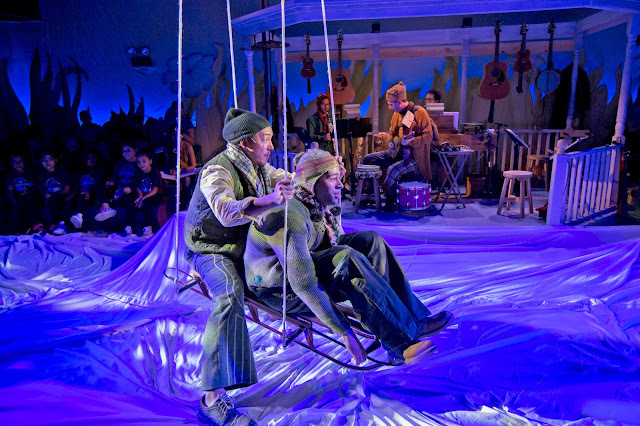 Single tickets to A Year with Frog and Toad are $33, and are on sale now at chicagochildrenstheatre.org or by calling (872) 222-9555. CCT also offers deeply discounted group rates, as low as $10 per ticket, for schools, playgroups, birthday parties and scouting groups. CPS schools may be eligible for financial assistance. Email GroupSales@chicagochildrenstheatre.org or call (872) 222-9555 to learn more. A diverse and talented cast of professional Chicago actors will play Frog, Toad and all of their animal friends. 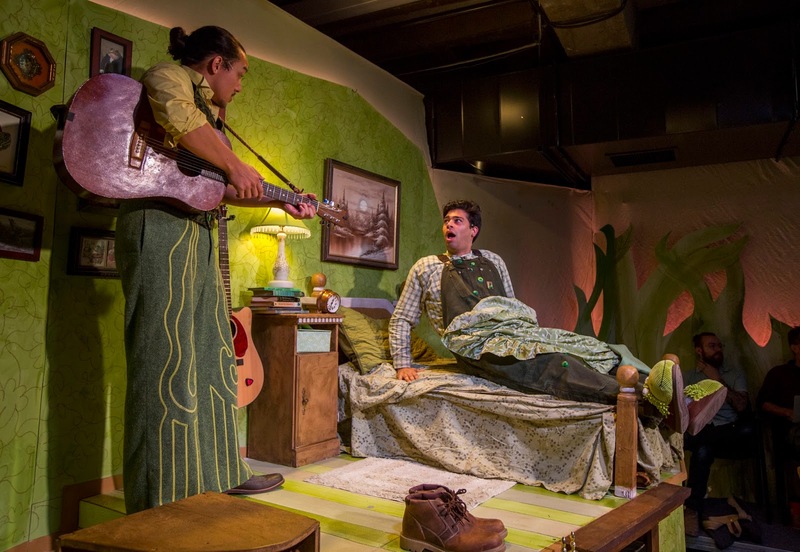 Audiences will recall Matthew C. Yee (Frog) from his memorable turns as the father in last season’s world premiere The Year I Didn’t Go To School: A Homemade Circus and as The Mad Hatter in CCT’s 2015 smash hit musical Wonderland: Alice’s Rock and Roll Adventure. Making his CCT debut is Andy Nagraj (Toad), a frequent performer at Court, Writer’s, Northlight, Silk Road Rising and TimeLine Theatre. Shawn Pfautsch, a founding member of The House Theatre of Chicago where his credits include Death and Harry Houdini and the title role in Cyrano, reprises the role of Snail following his unforgettable performance in CCT’s 2013 remount of A Year with Frog and Toad. Also making their Chicago Children’s Theatre debuts are Lauren Vogel (Bird #1, Mouse, others), who has performed regionally and in Chicago at The Hypocrites, A Red Orchid and TrapDoor Theatre and Jazelle Morris (Bird #2, Turtle, others), who has performed at Steppenwolf and Black Ensemble Theater. The production team includes John Musial (scenic design), Rachel Healy (costume design), Lee Fiskness (light design), Ellie Terrell (prop design) and Ari Clouse (stage manager). “A child of the 1970s, I grew up with the Frog and Toad stories when they were first published. My mother shared these delightful, thoughtful and funny stories with me at an age when I was just starting to make friends and figuring out what it meant to be a friend,” said Stuart Carden. “Now, with twin five-year-olds I am so happy to reconnect with Arnold Lobel's timeless stories and share them with a whole new generation of kids. Our production will be a wonderfully immersive experience for audiences as the theater will be wrapped in the vibrant natural world illustrated in the book, allowing children and adults alike to feel as if they've stepped into the meadows and forests of Frog and Toad's world. 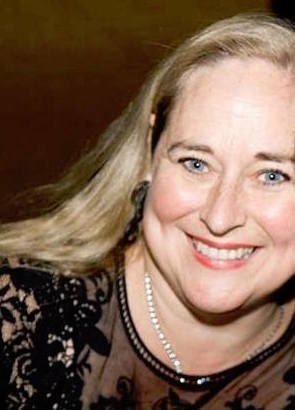 Also new, the superb music director Andra Velis Simon is customizing the infectious Dixie-land jazz score for this production and will lead our cast of actor-musicians as they play music on every song." Andra Velis-Simon is a music director, adapter/arranger, vocal coach and pianist based in Chicago. Regionally, her work has been seen at the Oregon Shakespeare Festival, A.R.T. in Cambridge, Brooklyn Academy of Music, Actors Theatre of Louisville, Berkeley Rep, Olney Theatre Center in Maryland, and Three Oaks in Michigan. In Chicago: The Goodman (The Iceman Cometh and Camino Real); Porchlight (On a Clear Day You Can See Forever); Theater Wit (Mr. Burns: a post-electric play and 10 out of 12); Chicago Children’s Theatre (The Hundred Dresses, A Year with Frog and Toad and Goodnight Moon); The Hypocrites (Cinderella at the Theater of Potatoes, American Idiot, Pirates of Penzance, The Mikado, and HMS Pinafore); and many others. 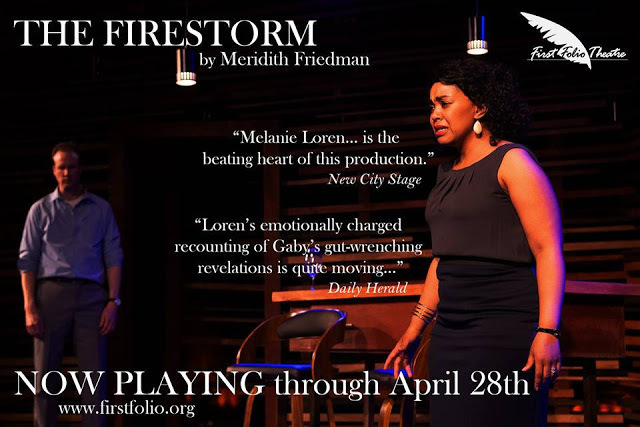 Velis-Simon is the Resident Music Director for Firebrand Theatre, and an adjunct faculty member at Columbia College Chicago, where she has taught musical theater performance courses since 2008. Frog and Toad are the main characters in a series of easy-reader books written and illustrated by Arnold Lobel in the 1970s. 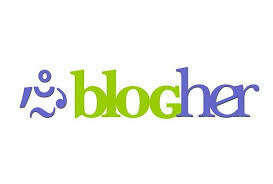 Each book contained five simple, humorous, often poignant short stories about their adventures together. Frog and Toad are Friends (1970) received a Caldecott Honor award and was named one of the Top 100 Picture Books of all time in a 2012 poll by School Library Journal. Frog and Toad Together (1972) won a Newbery Honor award. 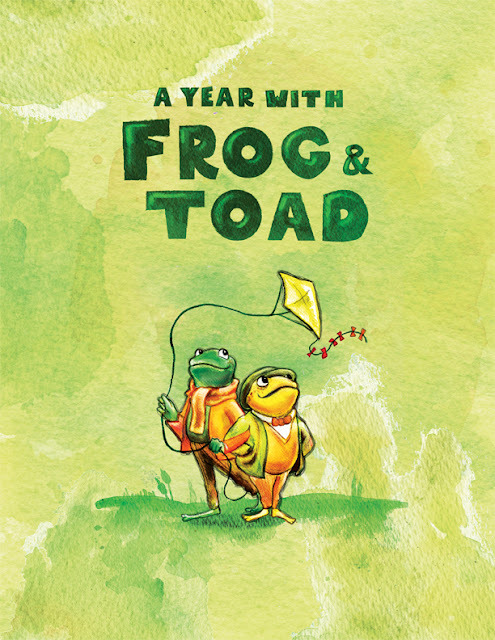 The musical A Year with Frog and Toad, adapted by brothers Robert (music) and Willie Reale (books and lyrics), was commissioned by Lobel’s daughter, Adrianne Lobel. It debuted in 2002 at the Children’s Theatre Company, Minneapolis, and was remounted off-Broadway later that year at New Victory Theater. 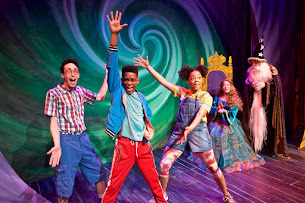 It ran briefly on Broadway at the Cort in 2003, won three Tony nominations (Best Musical, Best Book of a Musical, Best Original Score) and broke new ground by bringing professional children’s theater for the 3-to-10-set to Broadway. Chicago Children’s Theatre continues to grow its commitment to serving all Chicago children at The Station by expanding its array of services for all patrons with disabilities. Each 2017-18 production will include an Access Weekend, during which all performances are presented with services for children on the autism spectrum or with Down Syndrome, children who are blind or have low vision, or children who are deaf or hard of hearing. Saturday, October 7, 9 a.m.
Saturday, October 7, 10:30 a.m., 12:30 p.m. and 3 p.m.
Sunday, October 8, 10:30 a.m. and 12:30 p.m. Note: Modifications are made to production elements like lighting, sound and music to avoid sensory overload, with a nearby Quiet Room. ﻿For more information about Access services, visit chicagochildrenstheatre.org/access or contact Access and Inclusion department at access@chicagochildrenstheatre.org. After 11 years of itinerancy, starting this fall all of Chicago Children's Theatre's family-friendly performances, classes, camps and community outreach initiatives will take place year-round at Chicago Children's Theatre's new permanent home, The Station,a beautifully renovated, former Chicago police station in Chicago's West Loop. 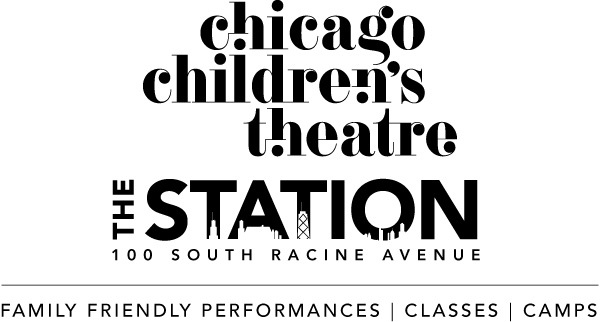 “Everything is happening at The Station” is the happy slogan for Chicago Children’s Theatre’s first full season in its new home, The Station, in the heart of Chicago’s West Loop community. After 11 years of itinerancy, all of the company’s family-friendly performances, classes and camps will finally take place in one location, Chicago Children’s Theatre’s new permanent home, a repurposed former Chicago police station at 100 S. Racine Ave., starting this fall. After A Year with Frog and Toad, children of all ages are cordially invited to enjoy tea or hot cocoa with CCT’s friends from the English Lake District at The Beatrix Potter Holiday Tea Party, December 2-17. 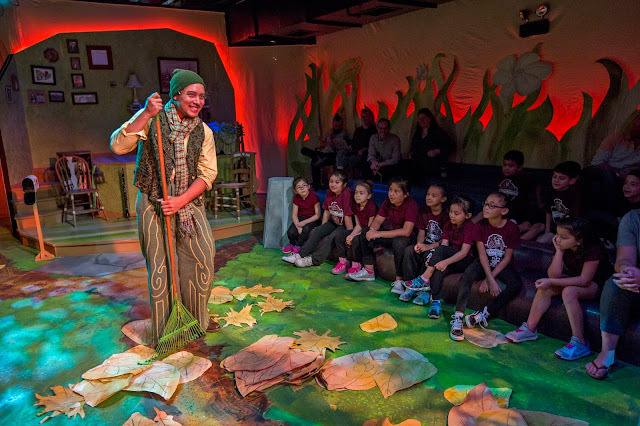 Spend the day with Peter Rabbit, Mr. Jeremy Fisher and Simpkin the cat as they delight audiences in this interactive trunk and puppet show, directed by Will Bishop and designed by Grace Needlman. With the New Year comes My Wonderful Birthday Suit!, a world premiere written and directed by Gloria Bond Clunie, January 16–February 18, 2018. When hurtful words about skin color slip out, best friends discover how to appreciate outer beauty while learning to seek the remarkable gifts inside each of us, complete with music, surprise and the wisdom of the splendiferous Thinking Tree. 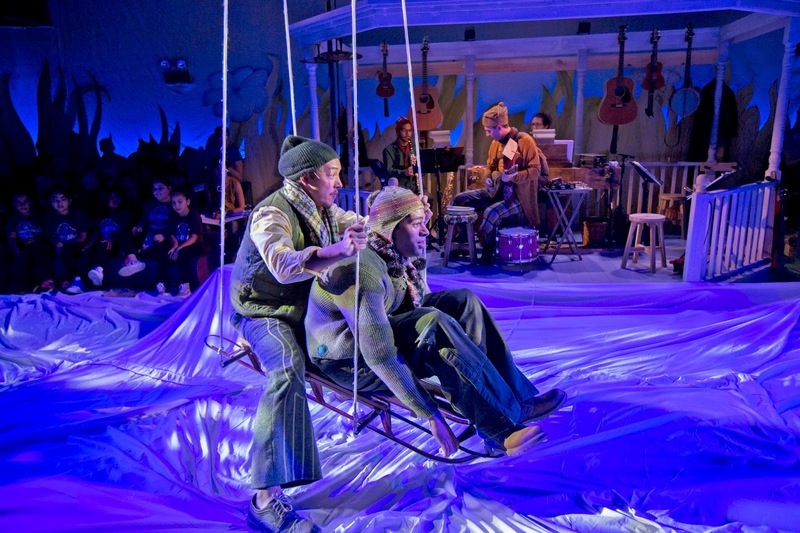 In the spring, The Station itself transforms into an all-immersive, two-story theatrical environment titled An Epic Tale of Scale, written and directed by Henry Wishcamper and Jo Cattell, collaboratively designed by CCT Community Programs Artistic Director Frank Maugeri, with original music by Gabriel Ruiz. Think The Magic School Bus meets Sleep No More, and you’re close for an encounter that surely defies description. Experience An Epic Tale of Scale, March 10-April 8. And talk about a finale! Chicago Children’s Theatre, in a co-commission with Children’s Theatre Company of Minneapolis, will debut Last Stop on Market Street, a world premiere musical based on the contemporary children’s book by Matt de la Peña and illustrator Christian Robinson, winner of the 2016 Newbery Medal, Caldecott Honor Book and Coretta Scott King Illustrator Honor Book. 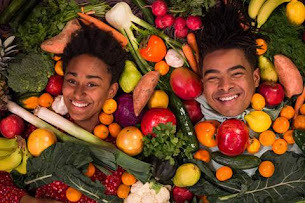 Playwright Cheryl L. West is creating this first-ever stage adaptation of Peña’s tale about a young CJ and his wise grandmother who teaches him to find beauty in everyday city life. CCT welcomes back the father and son songwriting duo, Motown music legend Lamont Dozier and his son Paris Ray Dozier, the team behind the music in CCT’s 2015 smash hit Mr. Chickee’s Funny Money, to create another original score. Henry Godinez directs. Andra Velis Simon is music director. 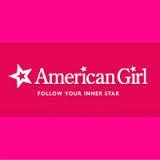 Performances are April 24-June 3. 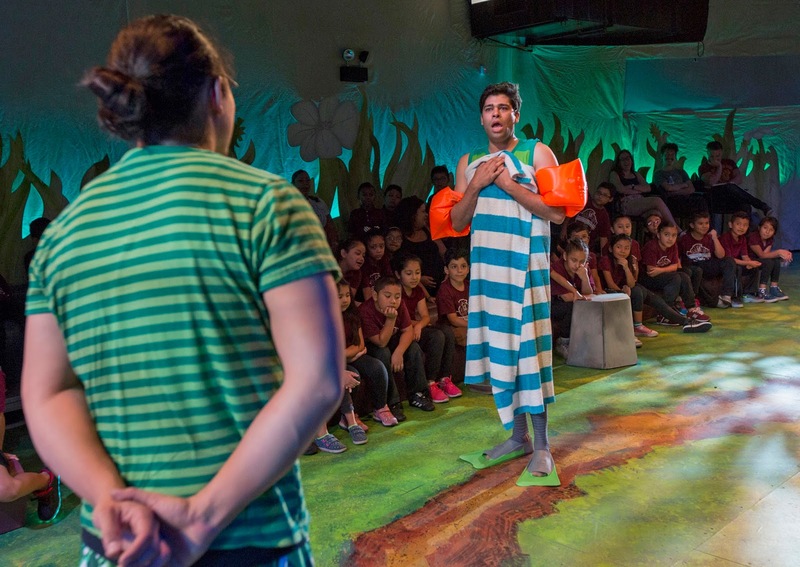 Chicago Children’s Theatre has transformed the former 12th District Police Station, located in the heart of Chicago’s West Loop neighborhood at 100 S. Racine Avenue, at the intersection of Racine and Monroe Street, into its first permanent home. The new Chicago Children’s Theatre, The Station, opened its doors in January 2017, and already serves as a beautiful, mixed-use performing arts, education and community engagement facility that welcomes all Chicago families. 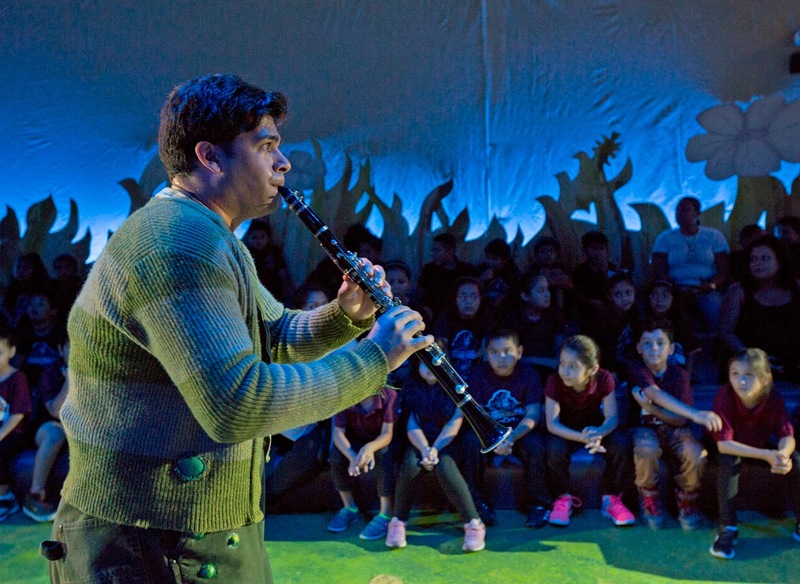 In addition to presenting shows in the Pritzker Family Studio Theatre, The Station boasts four classrooms for a year-round roster of classes and camps for toddlers to teens. Fall classes were just posted. 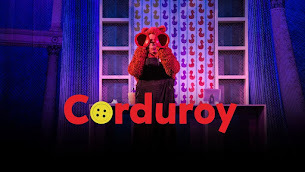 Go to chicagochildrenstheatre.org/education for the full roster of educational offerings and to register. Additionally, CCT now has its own dedicated space at The Station for Red Kite programming for children on the autism spectrum and other special needs. These children have opportunities to participate in Red Kite Adventures and CCT’s annual Camp Red Kite, the only summer arts camp of its kind in Chicago. 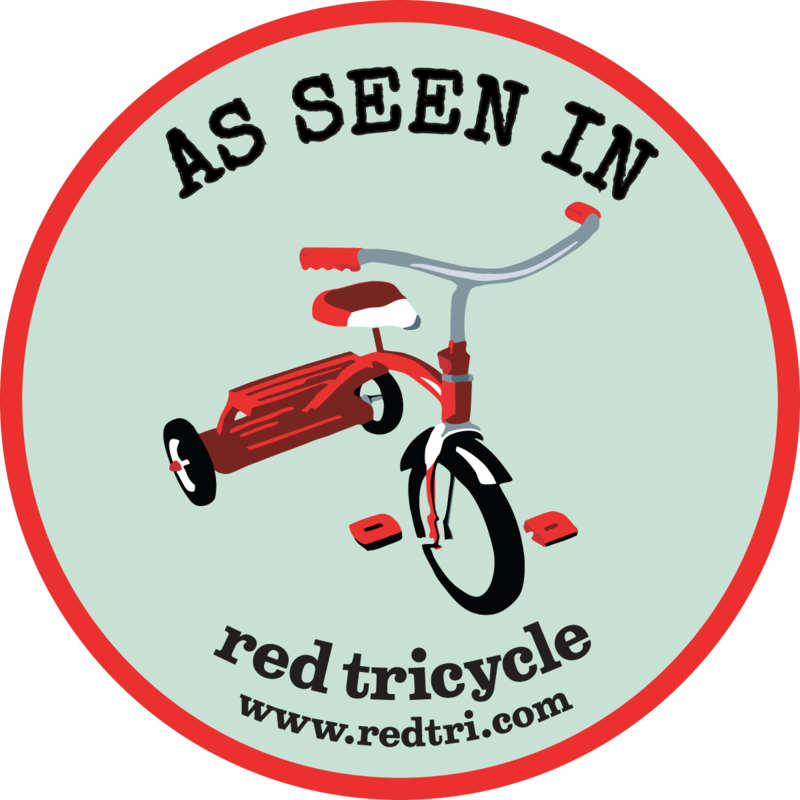 Visit chicagochildrenstheatre.org/redkiteproject to learn more and register. Led by Co-Founders, Artistic Director Jacqueline Russell and Board Chair Todd Leland, and Community Programs Artistic Director Frank Maugeri, Chicago Children’s Theatre is supported by a dynamic Board of Directors comprised of dedicated individuals from the fields of entertainment, philanthropy and business. Chicago Children's Theatre is sponsored in part by ComEd, Goldman Sachs Gives and JP Morgan Chase.